ARC CEO and President Jan Noble was recently asked to present before the Indiana Governor’s Task Force on Drug Enforcement, Treatment and Prevention on behalf of the Elkhart County Drug Free Partnership (ECDFP). The Task Force consists of persons concerned with the impact of drugs and alcohol on Hoosiers throughout the state. This body will be making recommendations that are expected to result in legislative and other policy changes relating to substance use issues. The Task Force is Co- Chaired by John Hill of Governor Pence’s office, and Dr. John Wernert, Director of Family and Social Services Administration in Indiana. Both actively participated in this session. Other members in attendance included State Senator Jim Merritt, and a number of others representing a wide variety of expertise across the state. 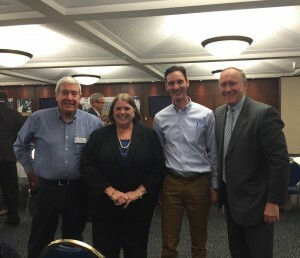 Alongside fellow ECDFP members Jim Starkey (President) and Sharon Burden (Treatment Committee Chair) – the group spoke at the November 19, 2015 meeting on the campus of the University of Notre Dame (in the historic Monogram room, Joyce Center). Representing the ECDFP contingent, Noble, Starkey and Burden had been requested to provide a short presentation as part of the meeting agenda. Jim Starkey started by offering a review of how local coordinating committees (LCC’s) were structured, how they obtained funds, how funds are distributed and requirements pertaining to allocations of funds (treatment, prevention and criminal justice). Sharon Burden, (Chair of PEPSA – the St. Joe County LCC), Director of the Alcohol and Addictions Resource Center (AARC) in South Bend, and member of the ECDFP, followed with more specific information regarding the activities and initiatives in St. Joe County (in general) and in Elkhart County (in the treatment arena). Jan Noble continued by giving examples of successes including the impact of bringing in expert speakers from around the country that have led to quality programming in Elkhart County. Specific citations included the Project STAR law enforcement Program, Social Norming Programming that is now in numerous county school systems, and treatment grants for low income individuals seeking substance abuse services. Immediately following the presentation, Task Force members offered a host of questions – which allowed all three presenters to interact. The meeting continued with a Public Comment period, and ended with the Task Force engaging in discussion and giving a number of recommendations, including official statements endorsed by State Senator Merritt.